Margaret Webster was the daughter of Thomas and Augusta Webster. Thomas Webster was a Fellow and Law Lecturer of Trinity College Cambridge, before becoming a practising solictor. Mrs Webster was a woman of letters, and an influential member of the London School board. Her works were highly regarded during her day, particularly, her translations of the Greek tragedies. 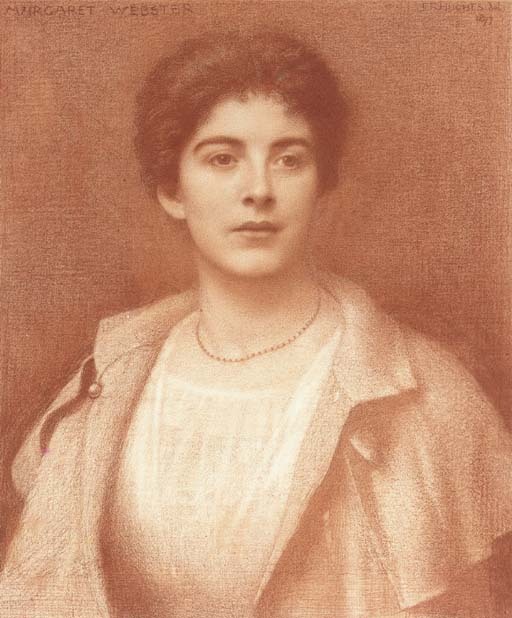 Theodore Watts, writing her obituary in the Athenaeum, 1894, said of her that she was 'a poet of remarkable intellectual strength, a prose writer of exceptional accomplishments and a philanthropist of peculiarly noble temperament.' The Websters were friends of the Rossetti family, and Christina Rossetti thought her 'by far the most formidable' woman poet of her day. Less is known of Margaret Webster, her daughter, but it is possible that she inherited her mother's literary gifts and was the author of a book entitled Shakespeare in Tears, published in 1942. The present drawing is typical of Hughes, who specialised in portraits in the medium of red chalk. Burne-Jones was impressed by his skill in the medium in a letter in 1897 he wrote; 'Your method of using (it) reads admirably, and since you have generously imparted it to me, I shall assuredly use it.' (Georgiana Burne-Jones, Memorials of Edward Burne-Jones, London, 1904, vol. 2, p. 322. Hughes was a nephew of the artist Arthur Hughes, and acted as an assistant to the elderly Holman Hunt.